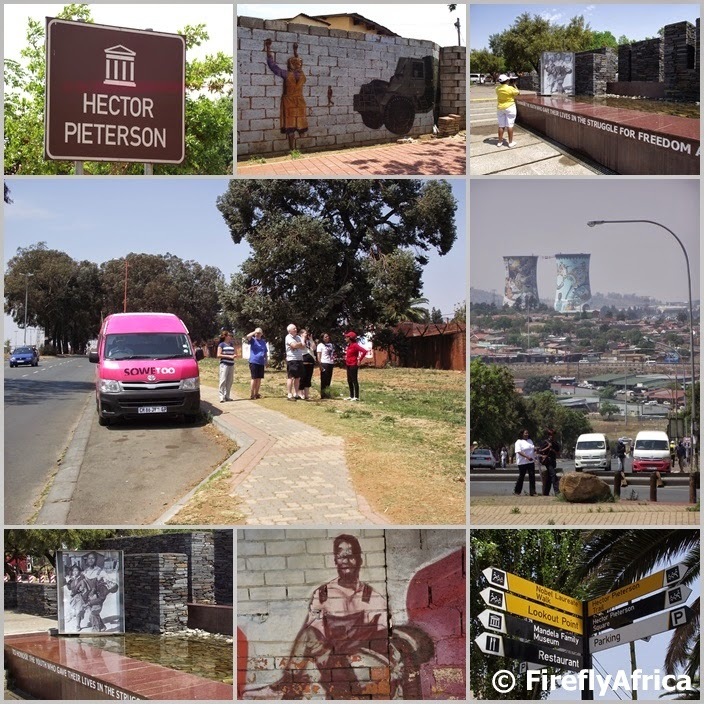 The Hector Pieterson Memorial is one of Soweto's iconic sites and a popular stop on a tour of the township. 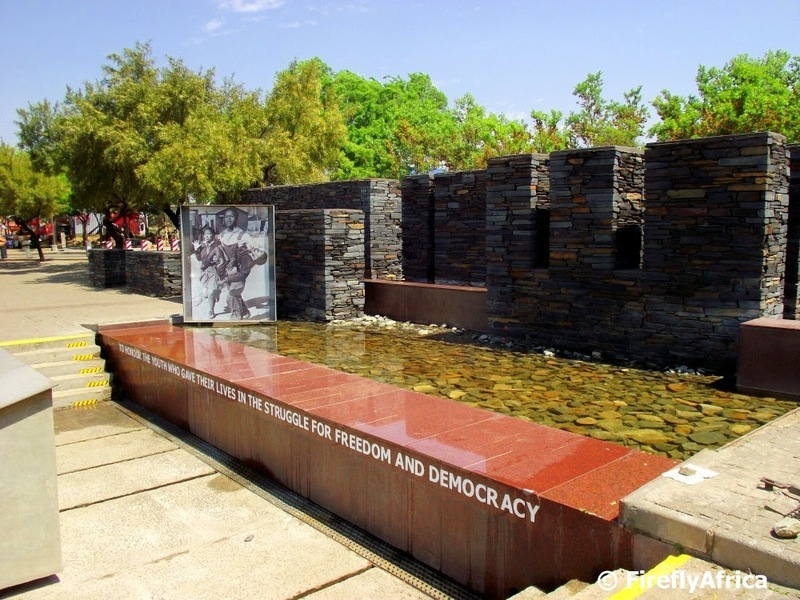 The Memorial along with the Hector Pieterson Museum is situated in Orlando West and commemorate the role of the country’s students in the struggle against apartheid. The site is just a few blocks from where the 12-year-old Hector Pieterson was shot on 16 June 1976 during the Soweto uprising when high school students from the township took to the streets in a peaceful protest against the mandatory use of Afrikaans as a language of instruction in black secondary schools. The iconic photograph of Pieterson’s body being carried by high school student Mbuyisa Makhubo, with his sister, Antoinette Sithole, running alongside, became a graphic representation of repression under the apartheid regime. 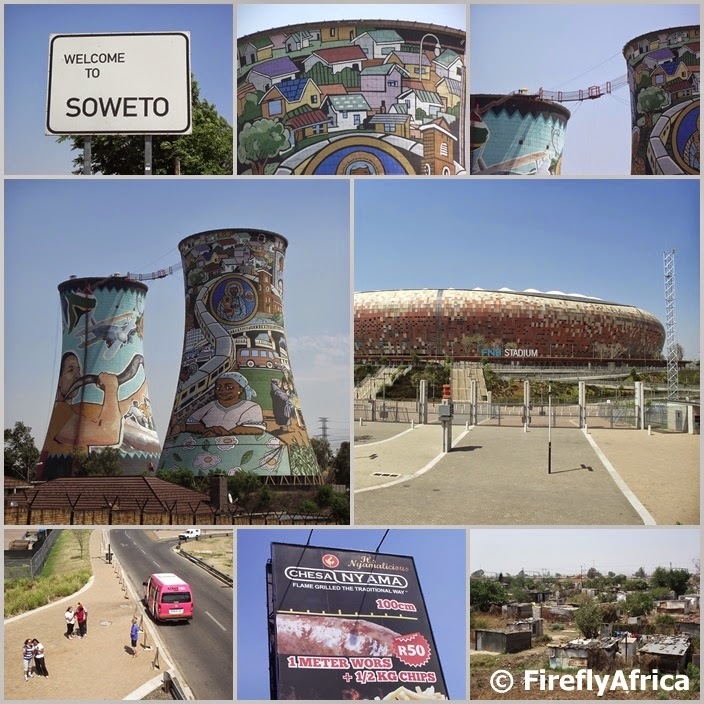 I've been to the memorial and museum before but got to visit again while on a City Sightseeing Tour of Soweto. This time around I gave the museum a skip due to time constraints but the memorial is definitively a must see stop when in Soweto. I got to say "I'm on top of the world". Well sort of. At least I can say I was on top of the tallest building in Africa. 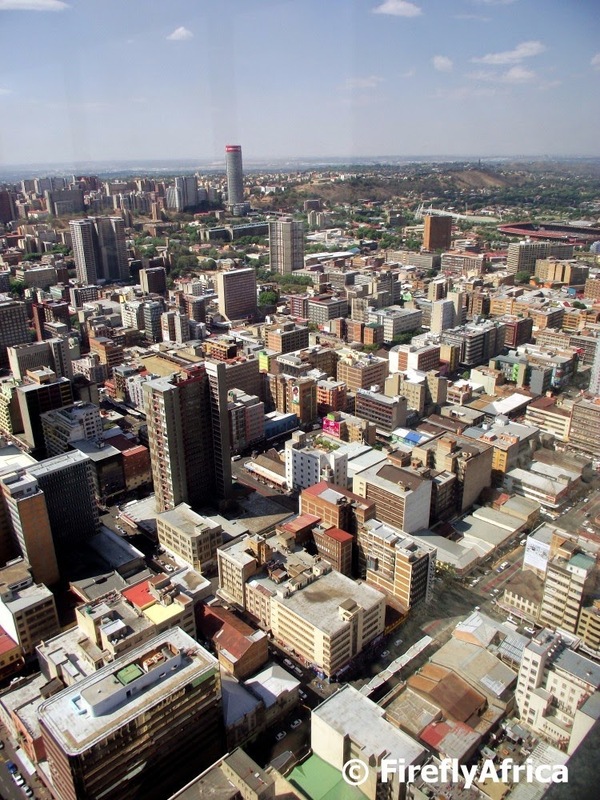 Exploring Johannesburg on the City Sightseeing tour I was quite keen to visit the Carlton Centre in downtown Jozi. Time allowed it and I hopped off along with a couple of my fellow travelers to head up, up, up. The great part of being on the City Sightseer tour is that they have a guide permanently based at the Carlton Centre who takes you through the shopping centre and up to the top. Entrance tickets are only R15 per person and the trip up the express elevator to the 50th floor literally takes seconds. Once at the top the guide took us around showing us the 360 degree view down, and I mean literally down, onto Joburg. The Carlton Centre is the tallest building in Africa (I think I've said that already) and once the tallest building in the southern hemisphere. It stands 223m high and was built between 1967 and 1974. The view is absolutely magnificent and the guide comes in very handy as he points out all the interesting landmarks as you move around the viewing windows. A great perk of the open bus tour. He also makes sure that you get back down and to the bus stop before the next bus comes by. I have to be honest. 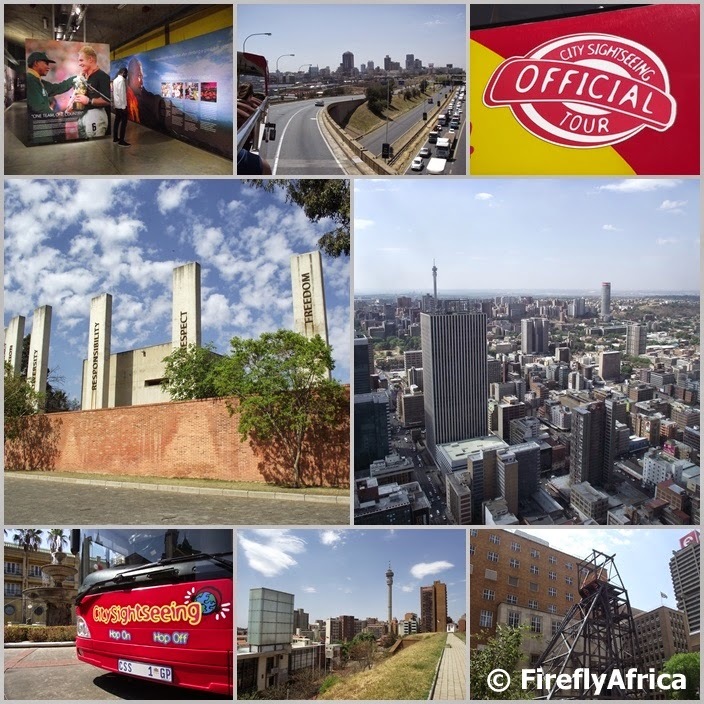 If I didn't go on the tour I probably would never have had the opportunity to do this so just another great reason to get your ticket for a City Sightseeing Joburg tour when you are in the City of Gold. Disclosure: I was in Johannesburg as a guest of the Tourism Grading Council of South Africa as one of the judges of the Lilizela Tourism Awards. 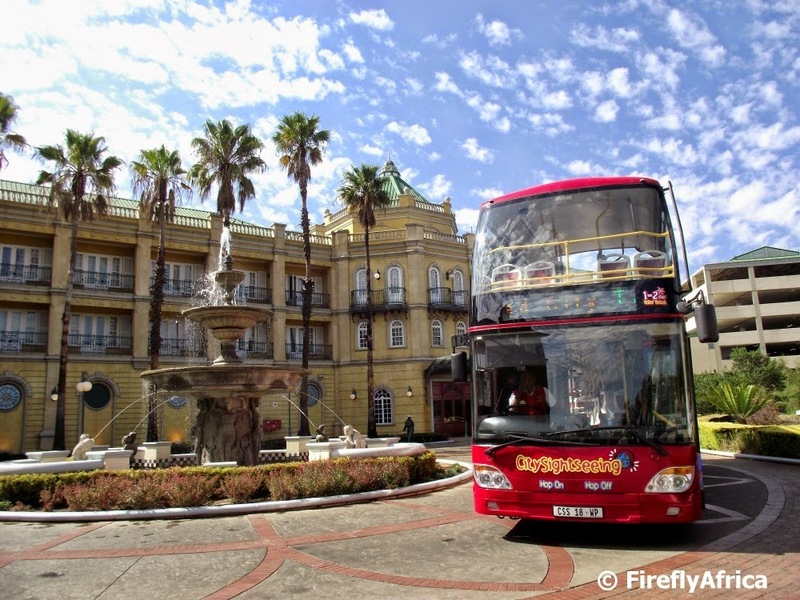 My tour with City Sightseeing Joburg was organized by Gauteng Tourism. If you are into soccer (or football as they call it in Europe), then you would at least have heard of the FNB Stadium. 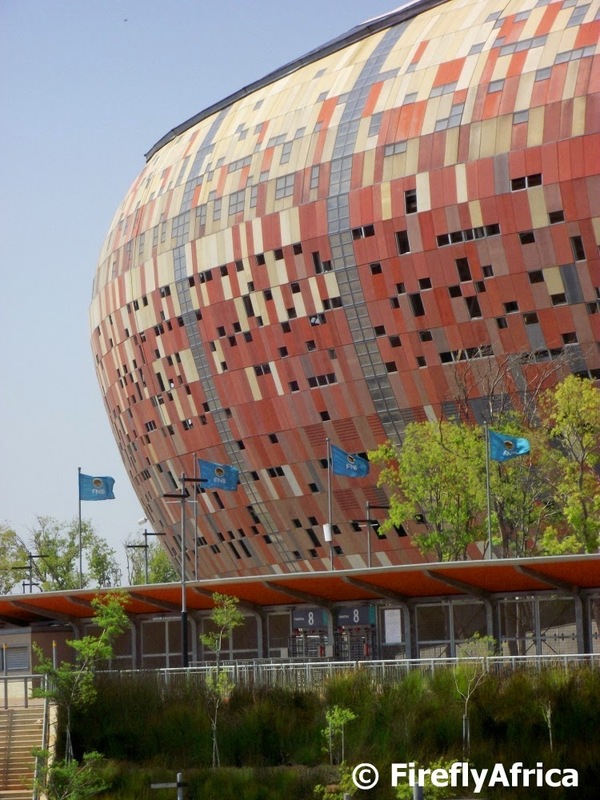 Also called Soccer City and The Calabash, the stadium is seen as South Africa's main soccer venue and is situated next to Soweto in Johannesburg. 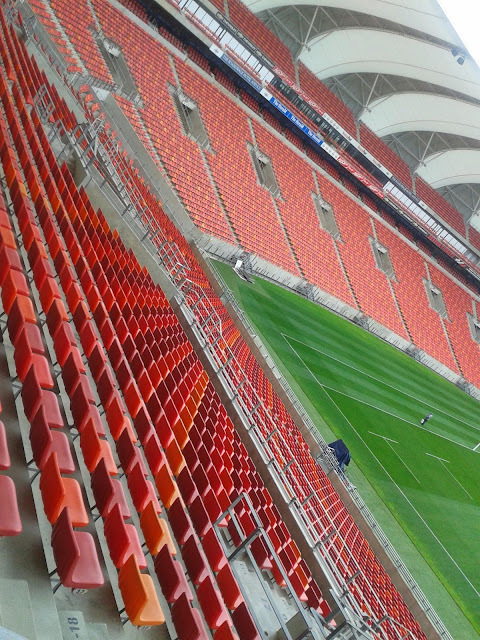 The stadium has a capacity of 94 736 making it the largest in Africa. 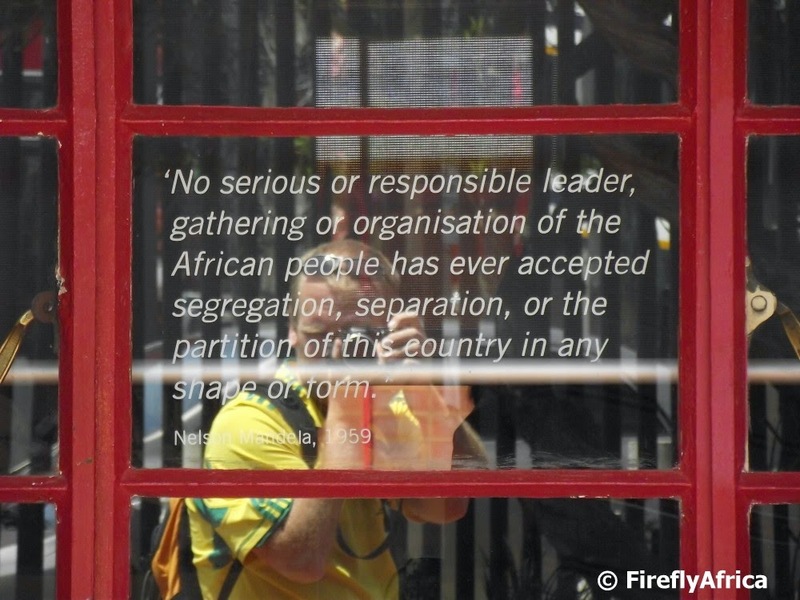 Significantly it was the site of Nelson Mandela's first speech in Johannesburg after he was released from prison in 1990 while it also hosted a massive memorial service to him after his death. The stadium was designed to look like a calabash, or African clay pot, from the outside. 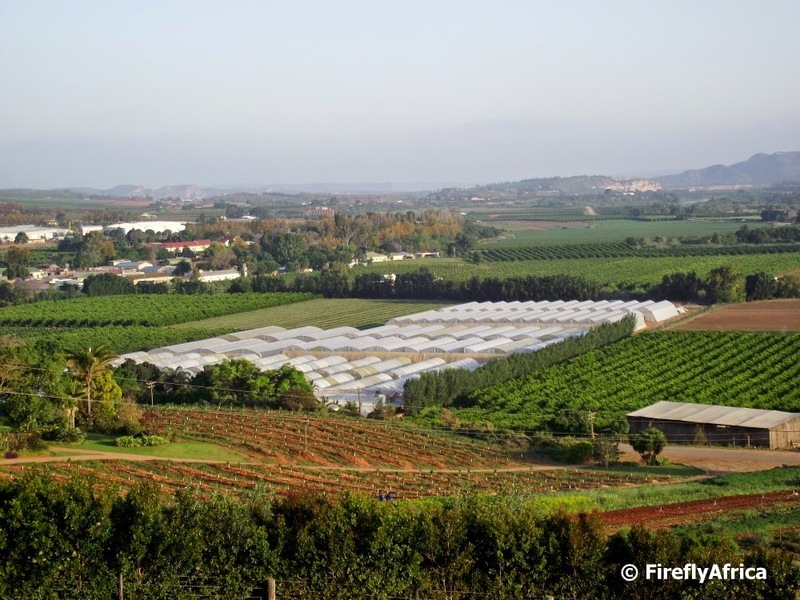 The cladding on the outside is a mosaic of fire and earthen colours and at night there is a ring of lights around the bottom of the structure which makes it look like there is a fire underneath the pot. The stadium hosted the finals of both the 2010 FIFA World Cup and the 2013 African Cup of Nations but has also played host to major rugby matches and many top music concerts. I've never had the privilege to go to a match at the FNB Stadium but its a little difficult being based over 1000 kilometers away. Perhaps some day though. 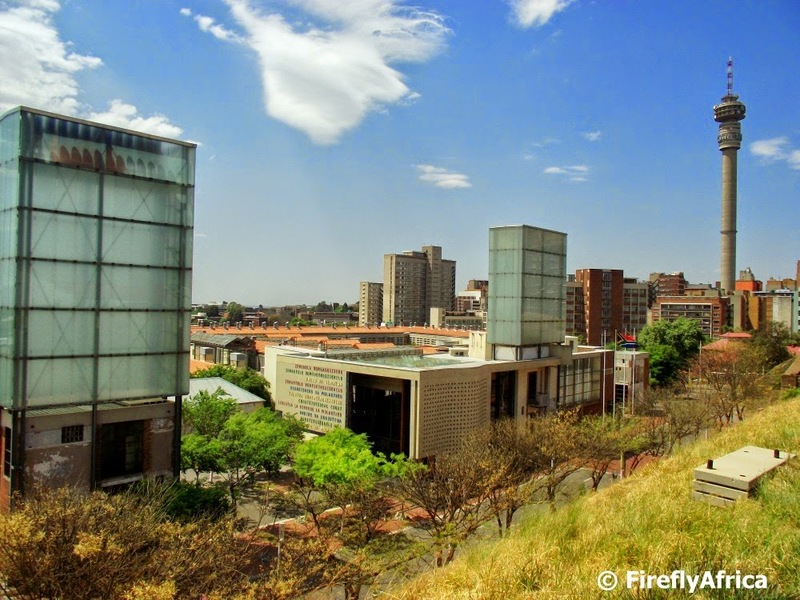 Constitution Hill is one of Johannesburg's most prominent heritage sites. It is the home of South Africa's Constitutional Court, the highest court in the country, and is located on the site of a number of prisons dating back to the Apartheid years. One of these prisons were Number 4 Prison (the other two were the Old Fort and the Women's Jail) where a lot of awaiting trail prisoners were kept during those years. Although most of the old prison buildings are no more, some of the stairwells were kept and made part of the new precinct as a reminder of the dark days of oppression. The Flame of Democracy is found in one of these stairwells and was established to celebrate 15 years since the signing of the constitution. 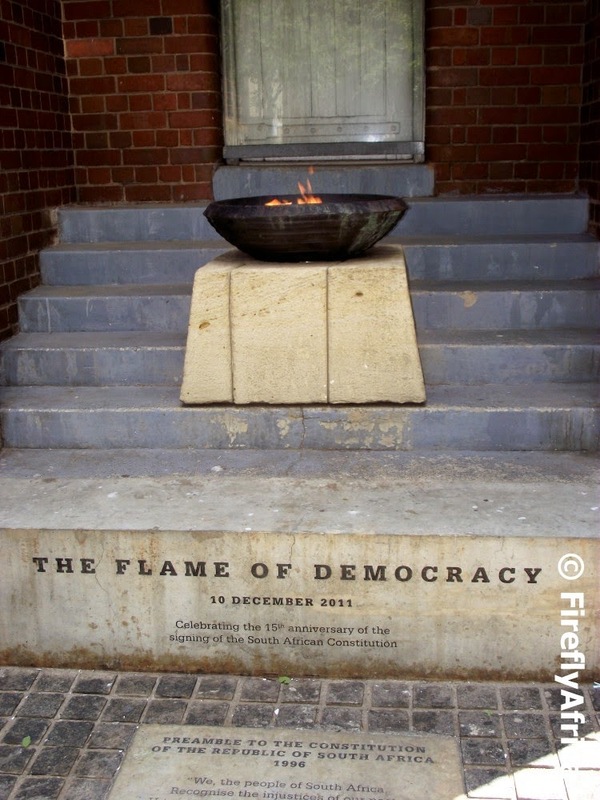 The flame was originally lit by Nelson Mandela in his birth place in Qunu and transported to Johannesburg where it was placed in this significant spot, never to be extinguished again. 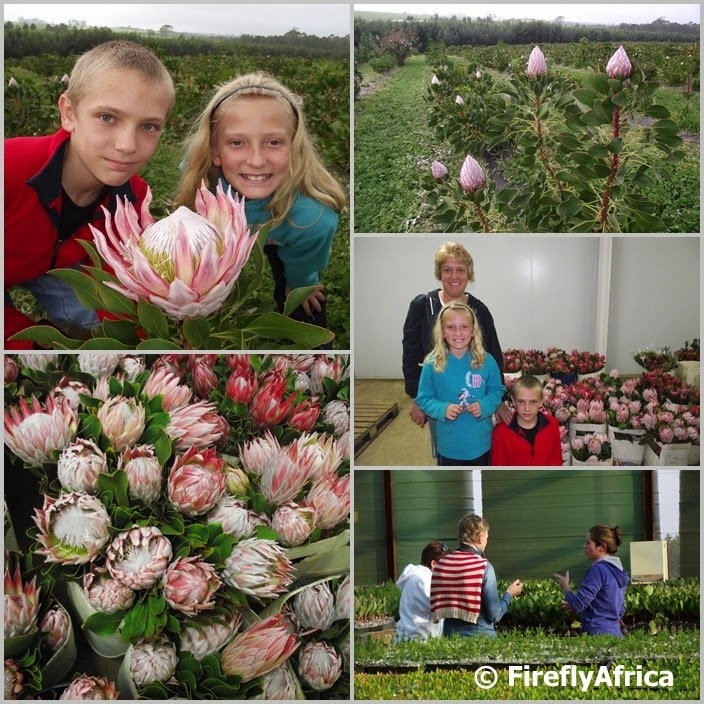 I really enjoy visiting places like this and I wish more South Africans would. In the USA a place like this would receive the biggest regard and respect by visitors who will make sure to include it in their itineraries and I can't see why it shouldn't be any different in South Africa. 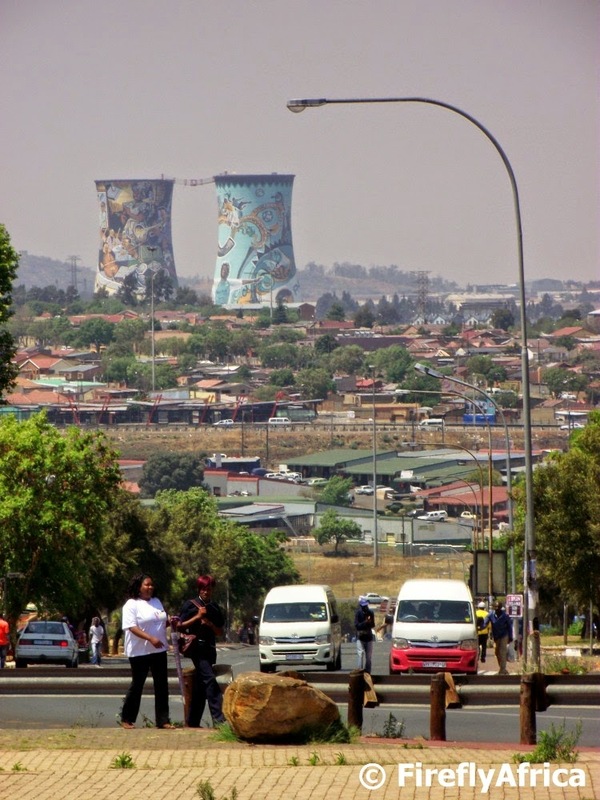 My visits to Johannesburg have always been ones of in and out, with very little sightseeing connected with it. Wham, bang, thank you ma'am. This means that I always look at the Joburg travel bloggers' blogs with longing wanting to see the places they write about. 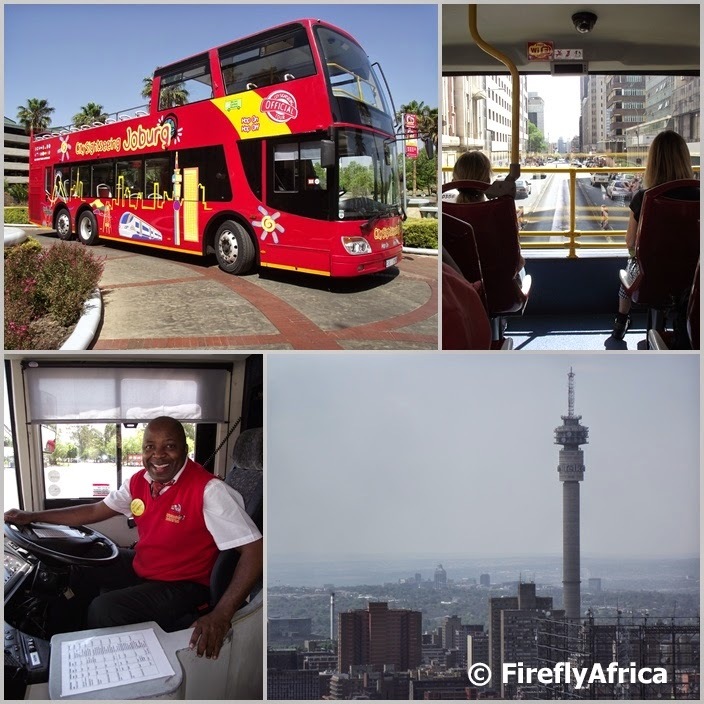 A two day trip to Johannesburg meant that I had some time on my hands to explore and a couple of calls later I had a reference number in my hand to join City Sightseeing Joburg for a tour of the city. City Sightseeing Joburg offers tours in their red open top buses along a set route and at scheduled times. This would allow me the freedom to get off and explore along the way, knowing what time the next bus came by to hop back on. 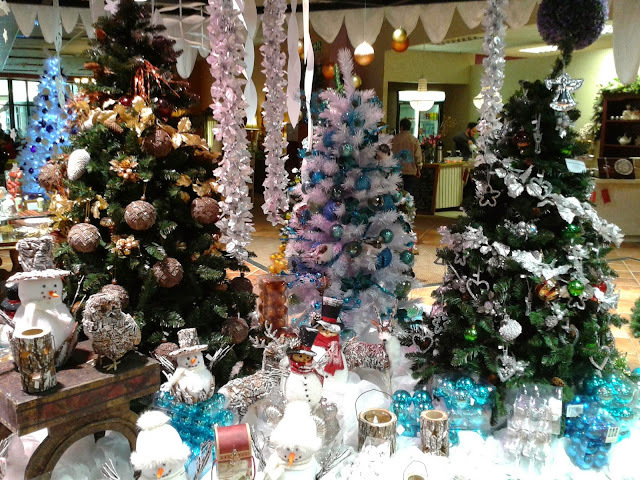 The starting points for the tours are the Gauteng Park Station and Gold Reef City while there are a total of 12 stops along the way where you can get off and visit an attractions or go for a bit of a walk. 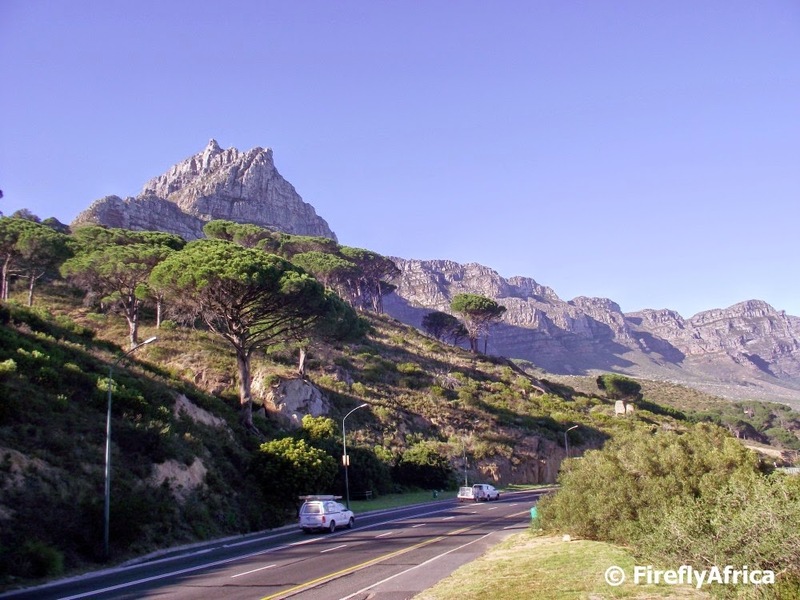 I was on the red eye flight from Port Elizabeth to Jozi and as soon as I got my car I headed over to Gold Reef City in the hope that I would be in time to catch the first bus of the day. Pulling into the parking lot on the hotel and casino side I spotted the red bus and seeing that I had 5 minutes before departure I headed straight to it. Eugene, the driver, met me with the biggest smile of the day. During the day I landed on his bus another two times and he had that smile every time I saw him. He printed out my ticket, gave me a brochure showing the route and, more importantly, the time table and offered me a pair of earphones to listen to the on board commentary. This all while asking me where I was from and giving me some advise on what I just had to see during the day and some timing tips. The Commentary by the way is done in 16, yes your heard right, 16 languages. When it was time to get going I took a seat upstairs, popped the earphones in my ears and made use of the on-board wifi to tweet my first picture of the day. The first of many to come. The commentary is very informative but not overwhelming. They tell you everything you need to know and what you see along the way without giving you information overload. It was impossible to get off at every stop but I knew what I wanted to do. My first stop was at the Apartheid Museum where Gauteng Tourism had organized entrance for me along with permission to take photos inside the museum. One can probably spend half a day in the museum, but two hours later I was outside waiting for the next bus while checking all the photos I took. I will do a photo blogpost about my visit to the museum shortly. 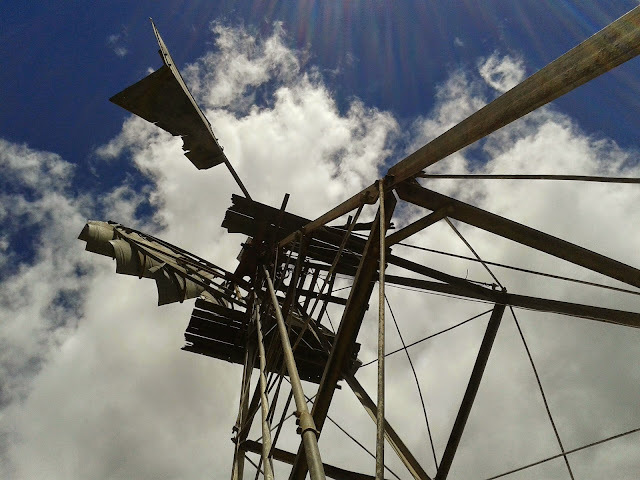 My next stop was in the mining district where I took a walk around to look for a couple of Geocaches I new was in the area. Too many muggles around meant I came up empty handed and I nearly missed the next bus when I saw it driving towards the busstop which was a good 400 meters from me. A flat out run and a waving arm caught the driver's attention and he waited for me at the stop. I gave Newtown and the Wits University Origins Centre (this one I'll definitively visit some time in the future) a miss and got off at Constitution Hill where entrance was also organized for me. Unfortunately the lady at reception didn't know I was coming and to quote her, "If I don't know you're coming then it wasn't organized." Not the friendliest reception. She eventually agreed to find out who knew about my visit but 30 minutes later when I went to ask her if she had found anything out yet her answer was, "What did you want again?" I immediately walked out and boarded the next bus. Very sad that I didn't get to see what I am told is a very special place, but it also meant I would now have time for a visit to the Carlton Centre. 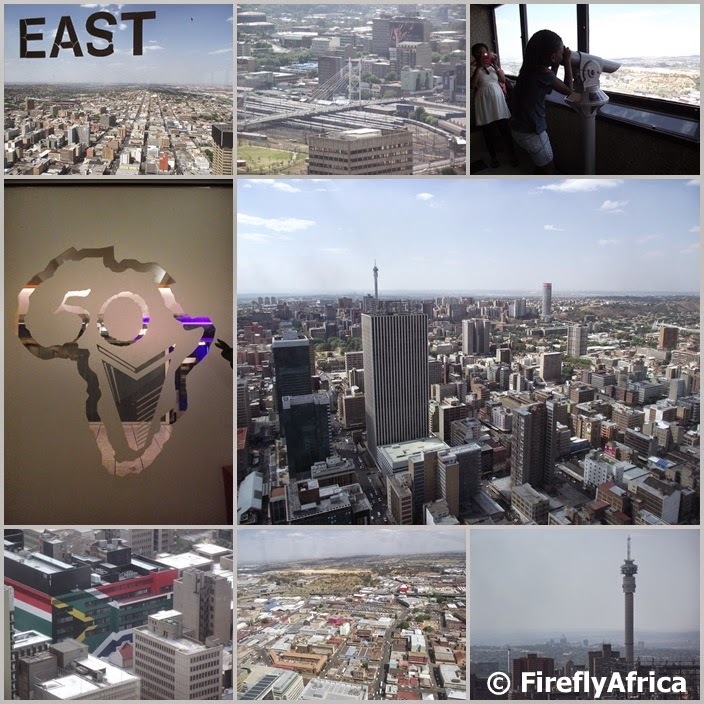 The Carlton Centre is the tallest building in Africa and the passengers who got off was met by a guide from City Sightseeing and we were taken to the observation deck at the top of the building. The view from up here is literally a bird's eye view and I will write about it in another post as well. Unfortunately for me the hotel I was staying at wasn't at Gold Reef City so I had to head back towards my car so that I could go and check in before getting ready for the Lilizela Awards I was in town for. I was very happy with what I got to see and learn, but I will have to come back to visit Newtown and Maboneng at some stage as these two areas are now at the top of my "Joburg to do list". After this day I can say with conviction that City Sightseeing Joburg is the best way to explore Johannesburg without any worries of getting lost, getting all the info you need and feeling safe and secure. Disclosure: I was in Johannesburg as a guest of the Tourism Grading Council of South Africa as one of the judges of the Lilizela Tourism Awards. 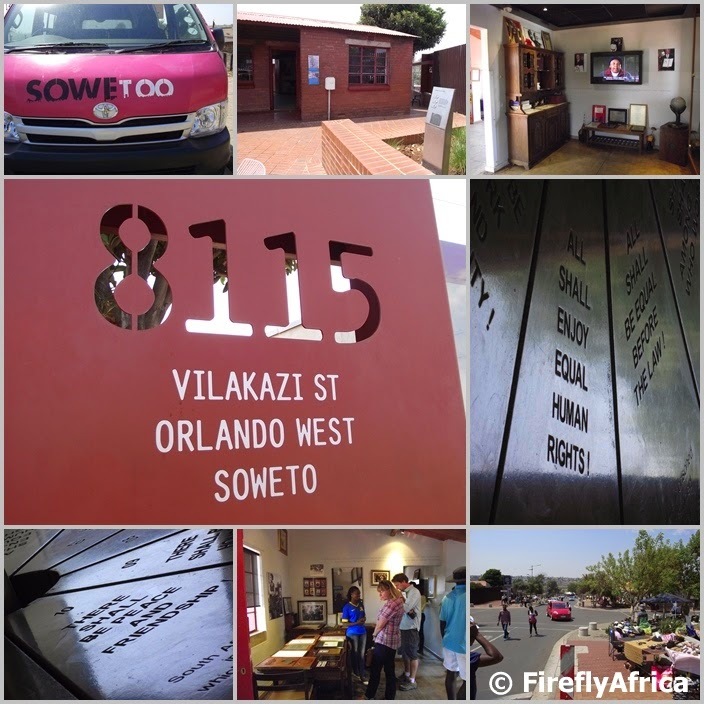 My tour with City Sightseeing Joburg and visit to the Apartheid Museum was organized by Gauteng Tourism. 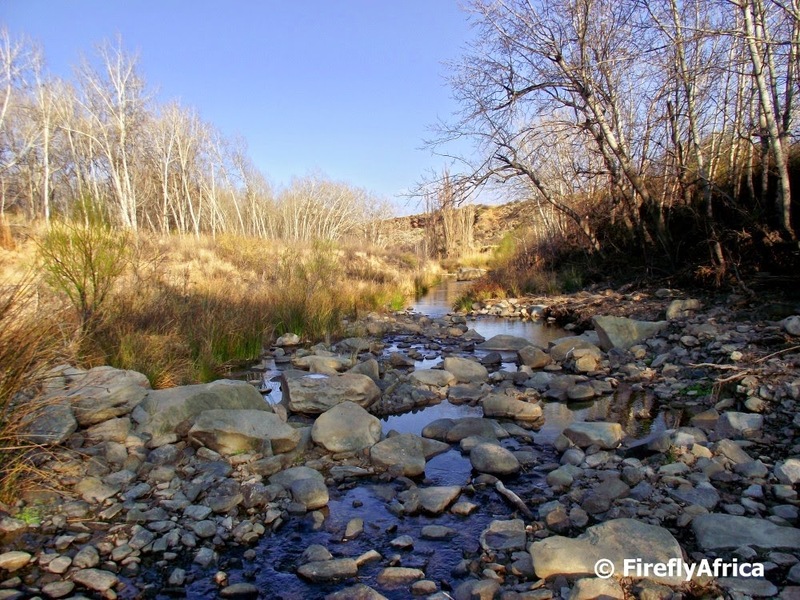 Fly fishing - An angling method in which an artificial "fly" is used to catch fish. The fly is cast using a fly rod, reel, and specialized weighted line. Casting a nearly weightless fly or "lure" requires casting techniques significantly different from other forms of casting. 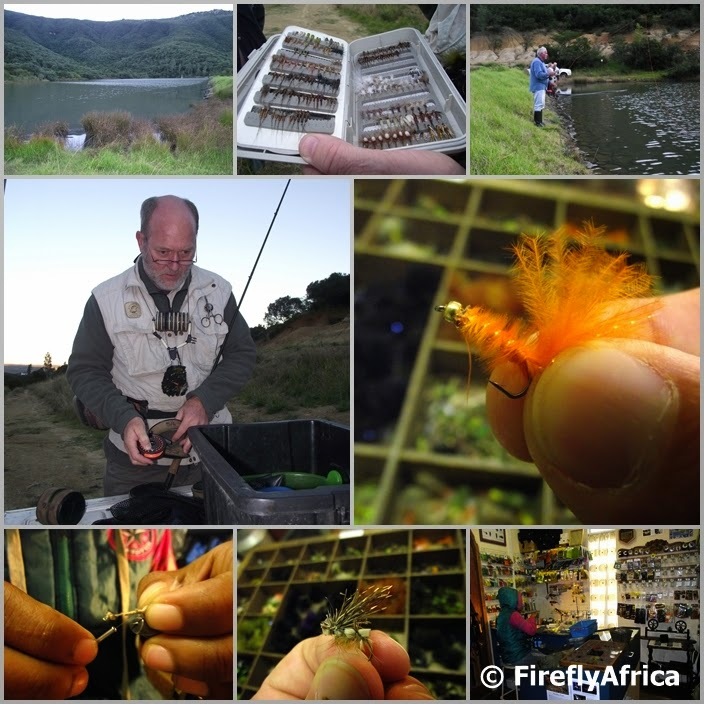 I've known Alan for a number of years now and by all accounts he must be one of the top fly fishermen in South Africa. I've been wanting to go fishing with him for a while now and on a whistle stop visit to Somerset East I got to accompany him to a nearby dam for an hour or so before the light faded and we had to pack up. That hour was more than enough though for him to demonstrate to me how it all works and for me to have a go. When you see somebody fly fishing on television it looks quite easy. You just flick the rod forward and back and wait for the fish to bite.... NOT! Its slightly more complicated. You hold the rod in your one hand and the line in your other. 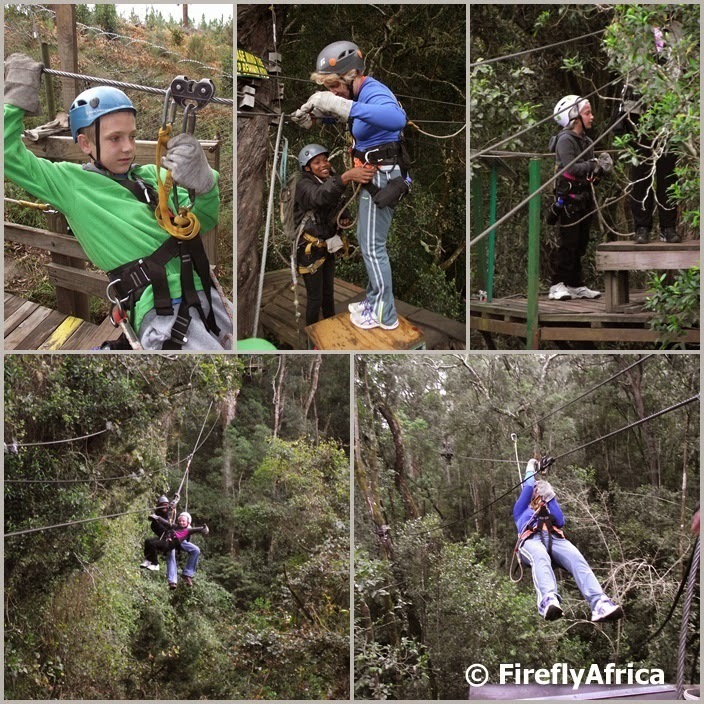 As you flick you let go of the line little by little to let the fly go further and further. Its also not just for flicking. There is a whole scientific technique to it, but after a couple of tries I got it right. Kinda. At one stage I even got a bite as well but it got away. 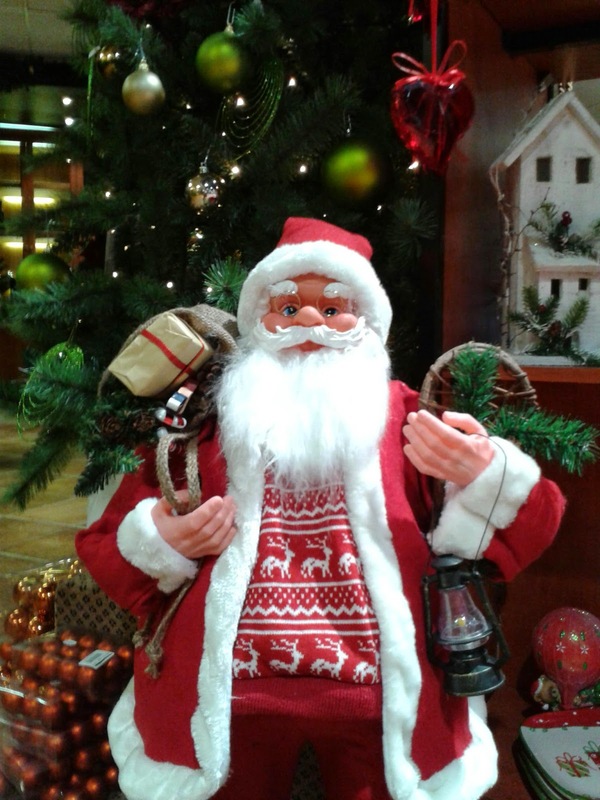 I have to tell you though, it must have been the same size as the one Alan is holding above. That is my story and I'm sticking to it. Back at the ranch guesthouse, Alan went to show me his fly shop. 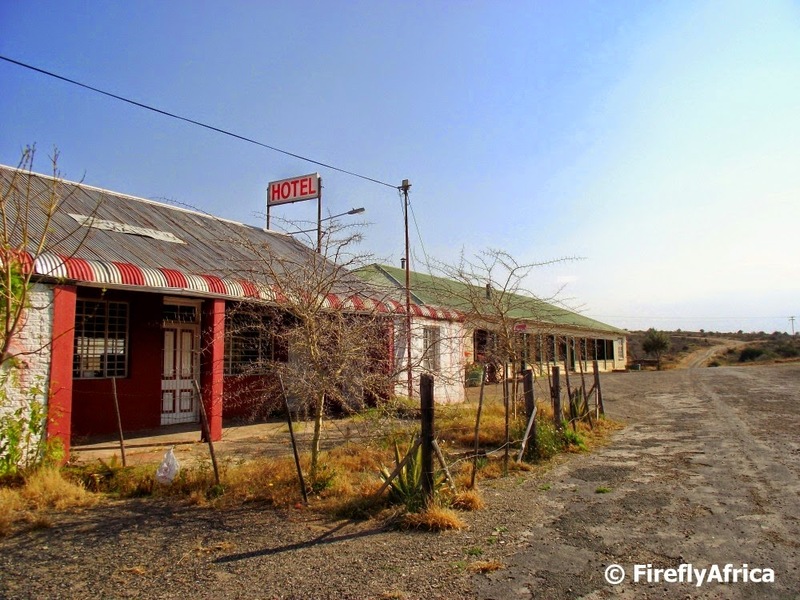 The fly shop along with the guesthouse's dining room and Alan's malt whiskey collection is situated in what used to be a Catholic Church on the premises of the guesthouse. There were flies everywhere and I just couldn't get enough of looking at the different styles and sizes. I asked Alan how you choose which fly to use and I again found out that science and biology is very much involved in it. If you really know what you are doing you choose your flies according to the conditions and what you see on the water. If you see little insects walking around on the water and there is fish movement around them, you choose a fly that looks like those insects. If there are flying insects, that is what you choose. Hectic! Clearly fly fishing is the total opposite of just sticking a worm on a hook on a line and casting it in just once. I was back in the fly shop the next morning after breakfast to watch Alan's fly tying assistant at work. Looking at her work I knew Alan had taught her well and even though I only had an hour or so by the water the previous night I knew he had taught me well too. Now to find an excuse to go and spend a full day out on the waters with Alan. 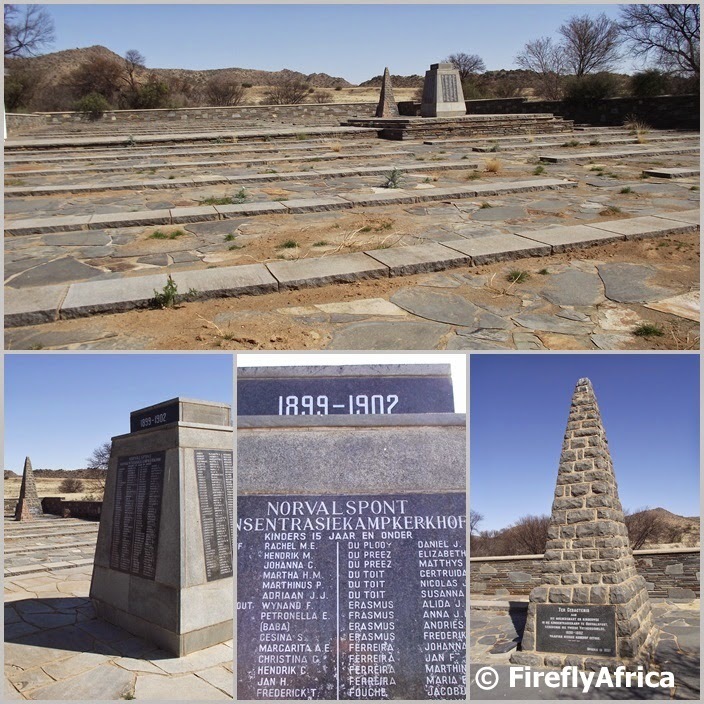 A little while ago I stopped by Fort Peddie on my way from Port Elizabeth to East London and discovered this historic site while hunting for a Geocache. The thing with most travelers is that they are so focused on the big things that they often miss the little ones. In this case the big things were the old tower and the cavalry barracks which I both went to have a look at. The former to find the cache and the latter because I wanted to see it as I was there already. 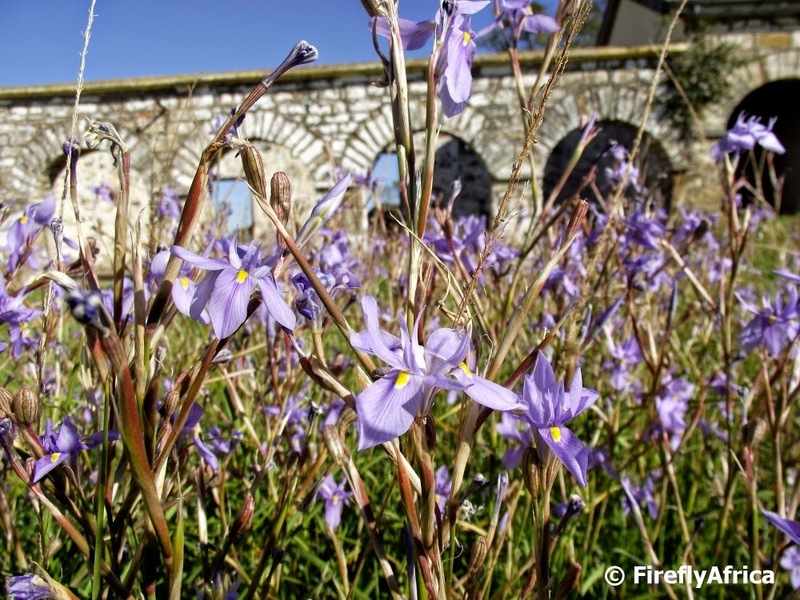 I noticed these pretty purple flowers growing outside the old stables and the staff working in the office nearby must have had a good laugh at me crawling around trying to get a nice pic without catching my own shadow. One of the beauties of travelling is exploring and discovering new places and things. I dropped my mom off in Despatch after a visit and swung through town to pick up a Geocache I hadn't ticked off my list. 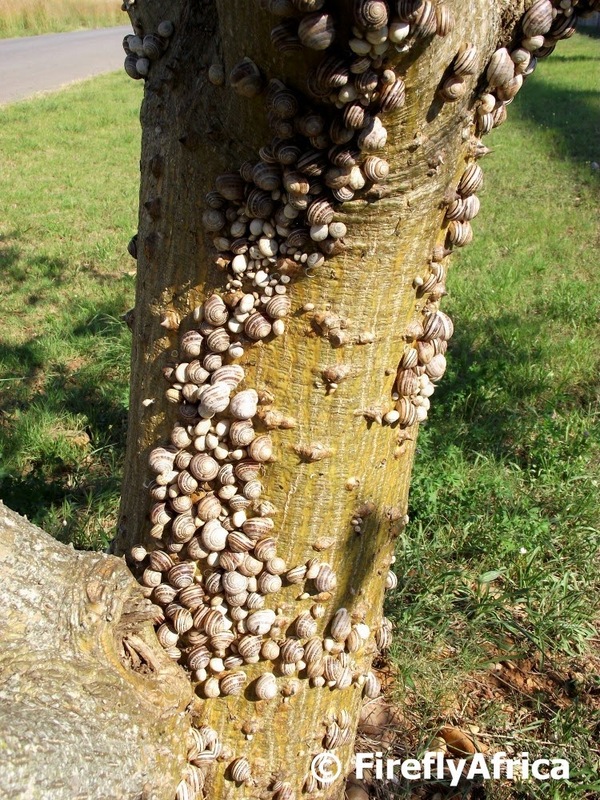 I parked next to a couple of Coral Trees (Lucky Bean Trees as some people know them) and on my way back to the car noticed a whole bunch of snails on one of the trees. And when I say a whole bunch I don't mean like 10 or 20. There were literally hundreds. On closer inspection I saw them on all the trees along the road but I selected the one with the most and grabbed my camera. I've been sitting with these pics for a while now and posted one of them on my Facebook Page. The pic got a lot of reaction and somebody asked why they do that. Going back to the day I saw this, I noticed that non of them were moving. It was as if they were dead. A snail cemetery perhaps. Pulling one or two of them off they had a film across the hole of the shell and the snail was still inside. Peculiar. So this morning I decided to consult my good friend Google. It took some time but finally I found out that some snails go into hibernation, specially during colder months and very dry periods. Not sure which one of the two was the cause of this mass hibernation as it was a dry winter. Both perhaps but regardless, always nice to discover and learn something new. 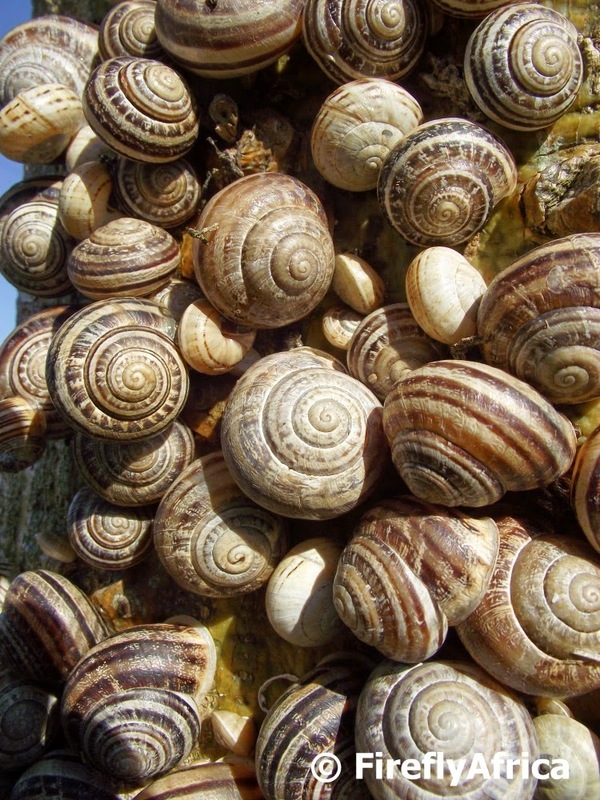 Some species of snails actually hibernate during the colder months of the year. They cover their bodies with a thin layer of mucus, which prevents them from drying out. 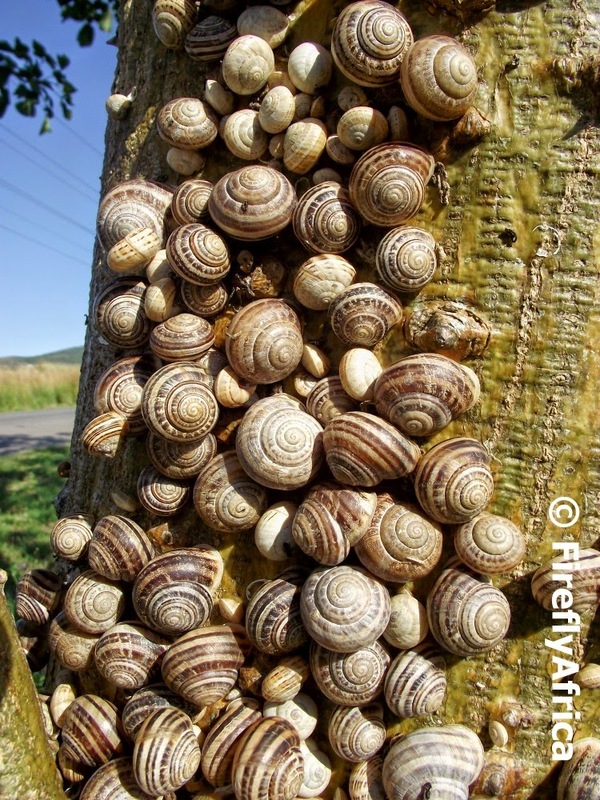 Sometimes snails are also able to hibernate in the summer to survive if they are faced with a severe drought. They live off of the stored up fat during this time of year. This process is one of the many reasons why they have been able to survive for million years. 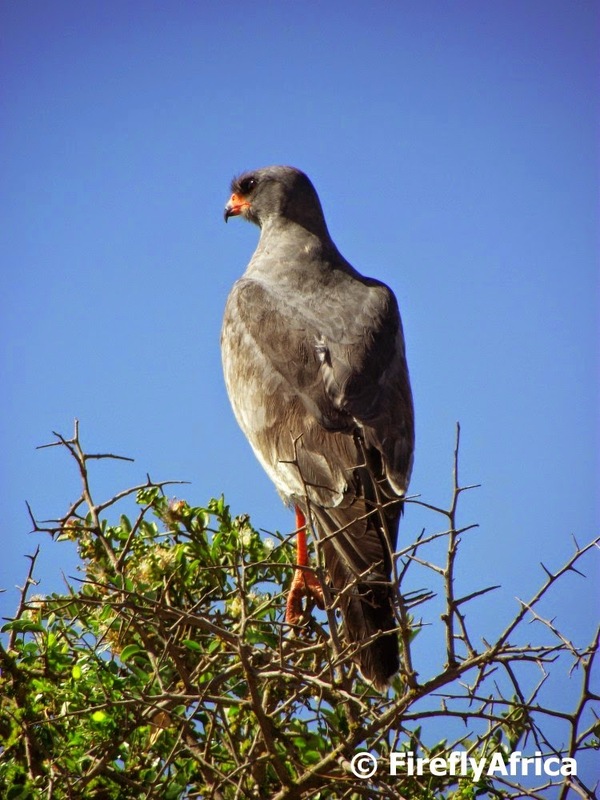 I'm an Eastern Cape boytjie through and through and I have so many wonderful destinations and places to visit right in my backyard, but I do enjoy to venture a little further every now and then and is always open to invitations *wink*. 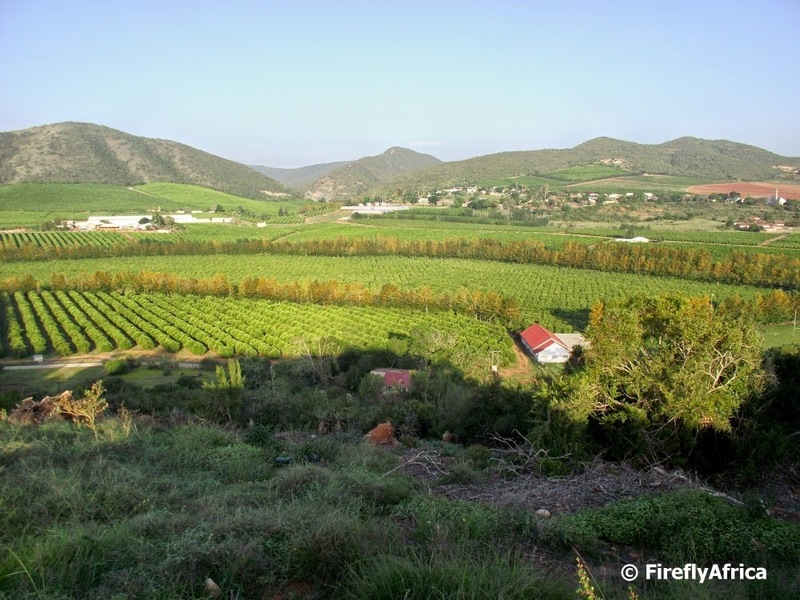 The Cape will always stay one of my favorite places away from home province and on my last visit I drove over Kloof Nek where I decided to stop and check out the Kloof Nek Cannons. I snapped this pic of Table Mountain from the side with the Twelve Apostles stretching away to its right. 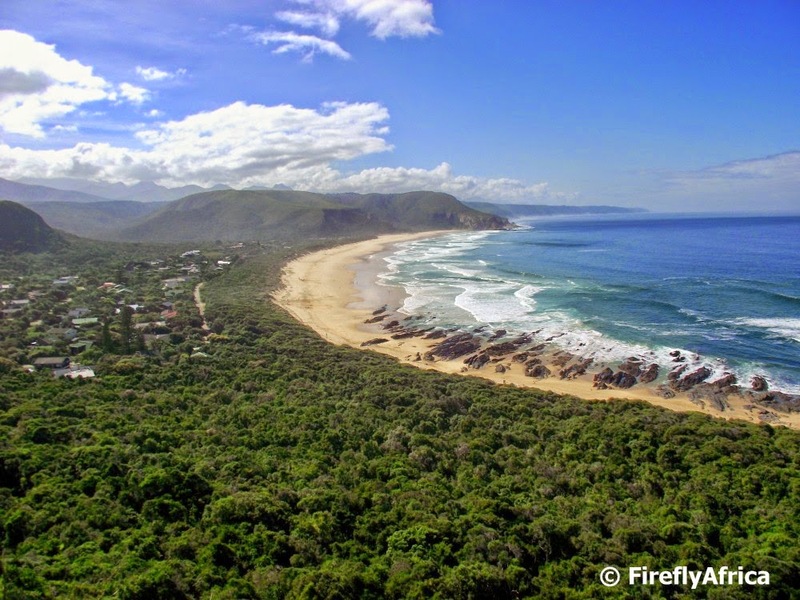 The Garden Route has some excellent hiking trails. 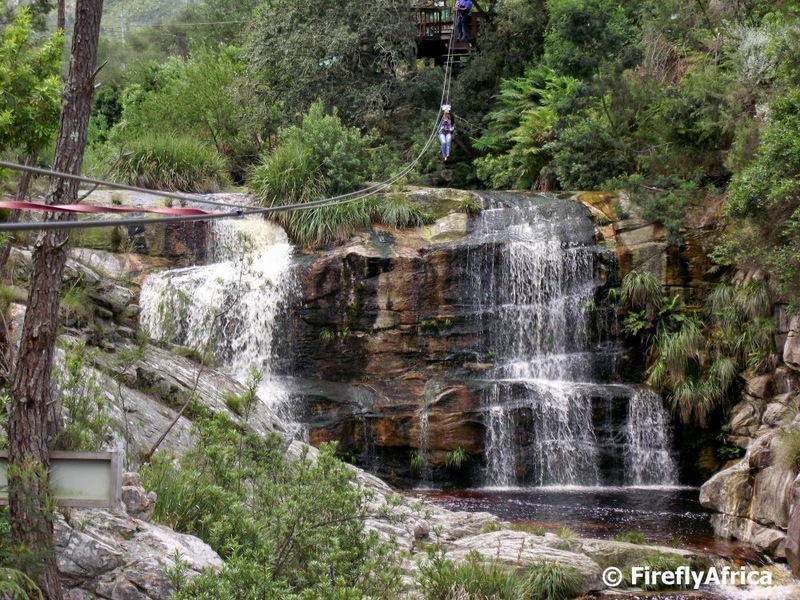 The Otter, Outeniqua and Tsitsikamma trails are epic and will take you a couple of days covering long distance lugging along backpacks while short loops like Storms River Mouth, The Big Tree and Garden of Eden will use up an hour of your time with only a camera over your shoulder before heading off to your next destination. These aren't the only trails though and whichever trail you choose will depend on where you are and how much time you have. 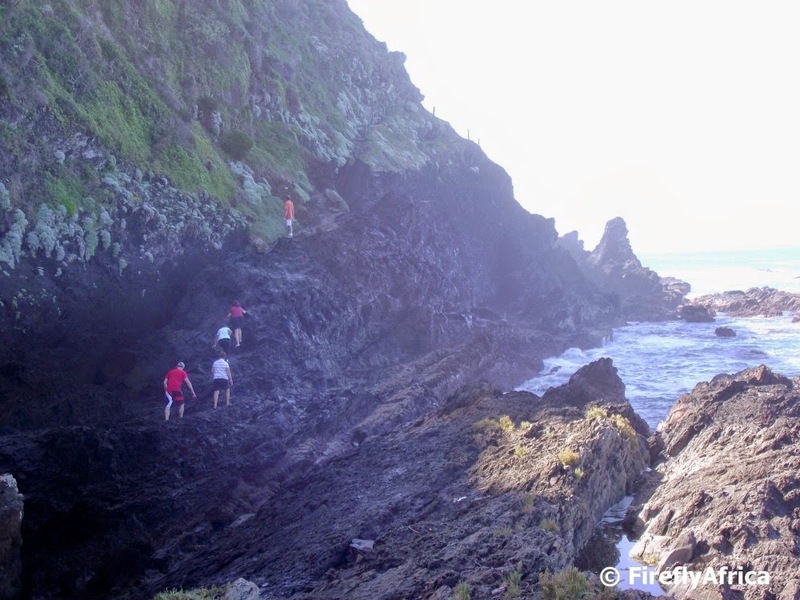 Spending a Sho't Left long weekend in the Crags and Nature's Valley we decided to put aside a morning to do the 5km round trip hike to Salt River Mouth. 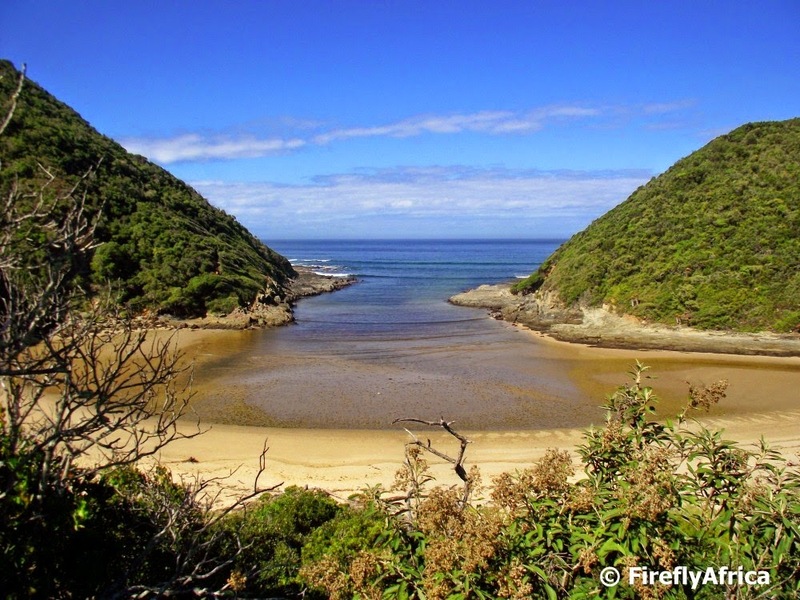 We left our car at the Nature's Valley Restaurant and Trading Store and headed off down the beach in a westerly direction. 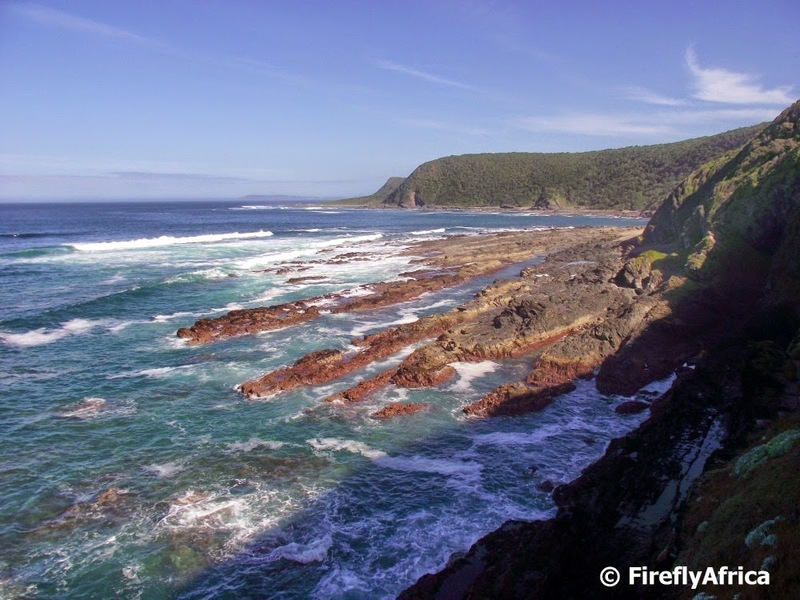 After a quick discussion we decided to do it anticlockwise so about 500 meters down the beach we turned right and followed the path through the coastal forest up towards the lookout point above Nature's Valley. The lookout point is the perfect spot to get your breath back after the climb. 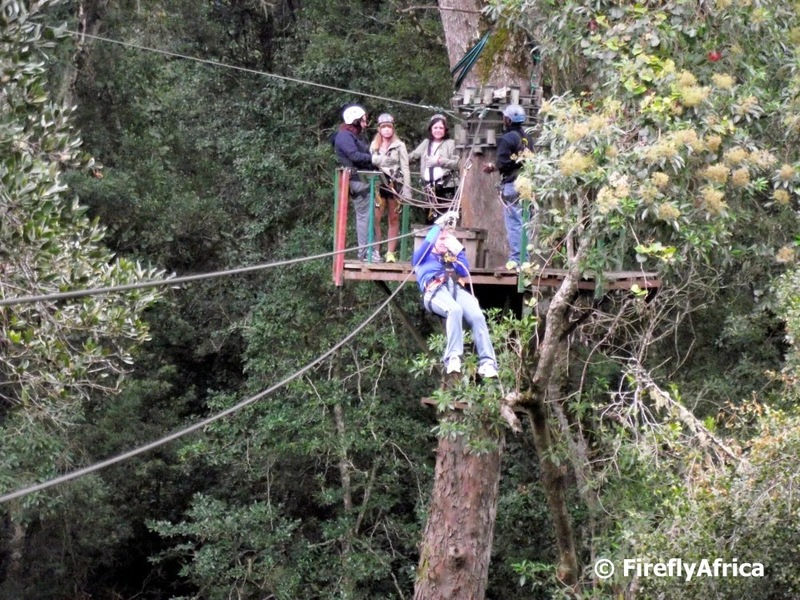 It gives you a stunning view of the coastline and Nature's Valley below. Shortly after the lookout point you turn left and from there it's downhill all the way to the Salt River. 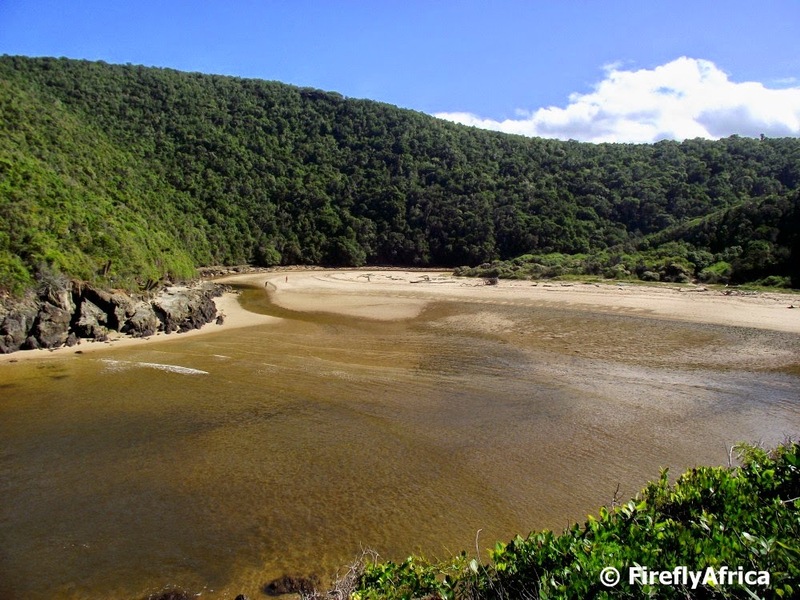 Before you get to it you start to catch glimpses of the river and the little lagoon by the river mouth. The path spits you out slightly upstream and from here you follow the bank down towards the ocean. We timed our walk to coincide with low tide so there wasn't as much water as you would find at high tide. There was more than enough water for a dip though and seeing the inviting water after a warm walk had the KidZ nagging for us to take a break before heading back. There's no body surfing to be done in the lagoon so the Damselfly just splashed down in the shallows while the KidZ and I explored the banks (yes, there was a Geocache to be found) and swam a little bit. This is also a great spot to break out the snacks we carried along. Although we didn't spot anybody while walking, I was quite surprised how many people actually made their way down the path and along the banks while we were there. After drying off in the sun a bit it was time to head back towards Nature's Valley, this time along the coastal route. After a short distance we hit an area I saw referred to somewhere as the Black Rocks. I imagine this could become an exciting little piece of traversing at high tide and I was quite glad that we chose low tide what with having the KidZ with us and all. After a bit of rock hopping and finding the best path to follow we reached a spot from where we could look back on the coastline. 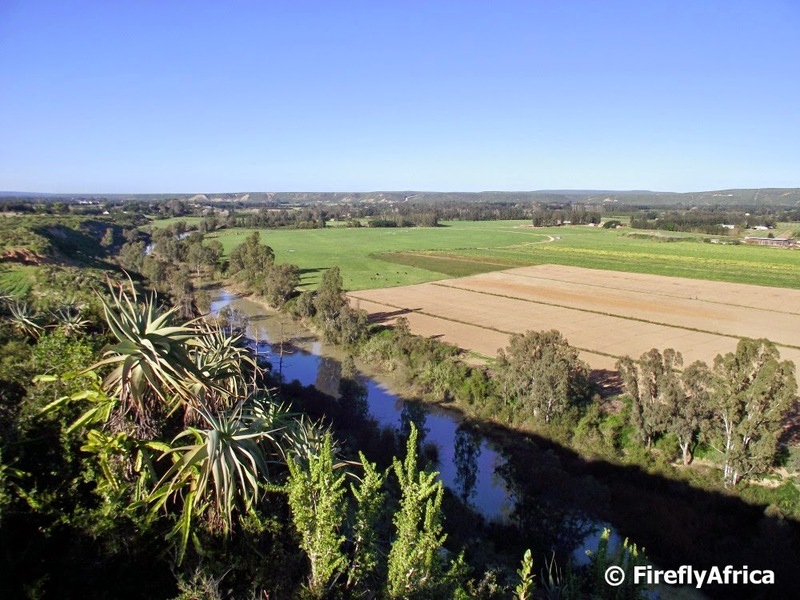 In the photo the Salt River is situated in the bay visible in the middle of the picture. From here it was about a kilometer back to the car. Not that we got back in the car. It was first time for an ice cream and something to drink at the restaurant while watching a couple of hikers who just finished the Otter celebrate. We may not have done the Otter, but we got to hike and see some of the beautiful coastline this part of the world has to offer. Very much the same as the okes on the Otter. The Anglo Boer War (1899 - 1902) is one of the big turning points in South Africa's history along with the arrival of Europeans in the country, the Great Trek, the Apartheid years and a new democratic South Africa. Okay, so the history is about more than just those five turning points but that is what came to my mind just now. One of the most significant things that happened during the Anglo Boar War was that it was the first time ever that concentration camps were used anywhere in the world. 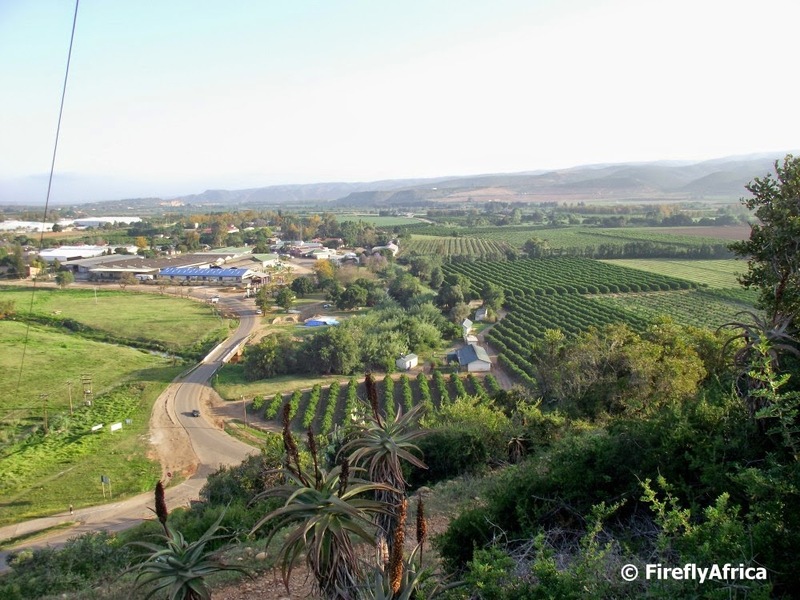 During the war thousands of men, women and children were kept in these camps with 4 177 boer women, 22 074 children under sixteen and 1 676 boer men dying in these camps. That's not even counting the over 14000 deaths in black concentration camps. A couple of years back we spent a holiday at the Gariep Dam and I read about Norvalspont where one of these concentration camps we situated. I never got a chance to visit the site but driving back from Johannesburg recently I decided to make a stop on my way back towards the coast. The turnoff was on my route and after about 2 kilometers on a smooth dirt road I came across the site. No magnificent monument, no fancy visitor centre, no guides hanging around to show visitors around and no tourist trap curio and food stalls. In actual fact, there wasn't another soul in sight. Just a big paved area surrounded by a low stone wall and three stone monuments with plaques on them. From what I can gather its the site of the concentration camp's cemetery. Norvalspont was seen as a model camp and was much better off than most of the other camps even though conditions were still very bad. 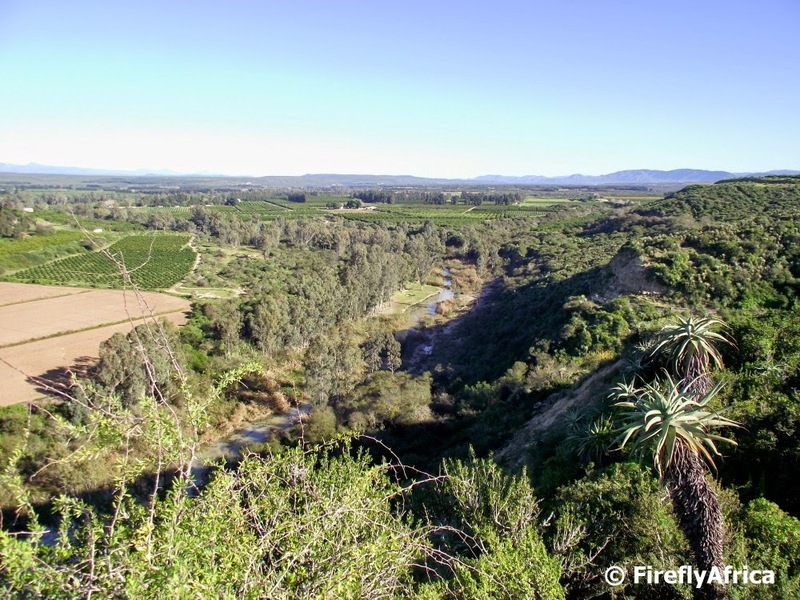 It was situated on the banks of the Orange River which meant that there was at least enough water and fire wood available. It was not that Norvals Pont lacked the problems of the other camps. On the contrary, the measles epidemic struck early and was followed by scarlet fever and diphtheria. 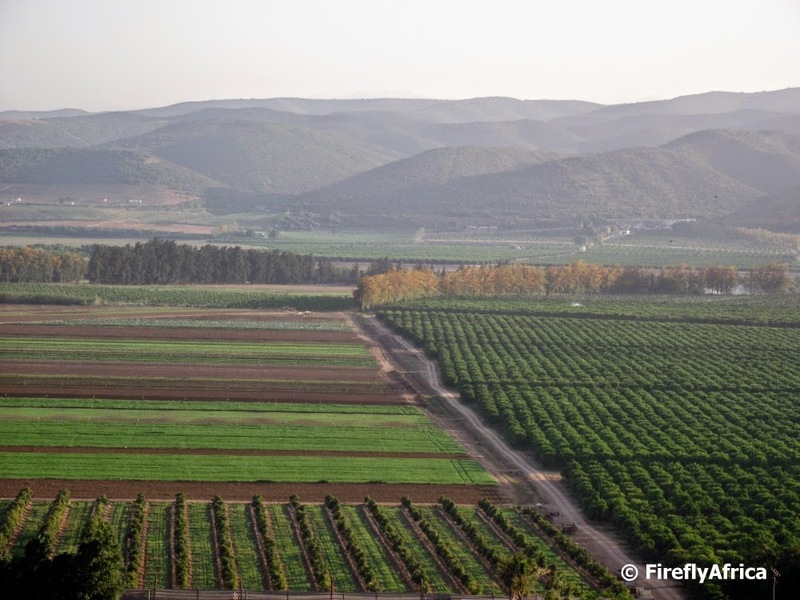 Families also poured in without warning and tents and blankets often ran out. The camp was one of those visited by Emily Hobhouse in 1901. At times there were over three thousands people housed at Norvalspont, all housed in tents on the site, while the camp had a total of four hundred and twelve deaths. Standing there on a warm winters afternoon without a breath of air moving and only cicadas calling it does become a bit of a profound experience. One where you realize how much sadness and despair there must have been right there yet there is also a spirit of strong and proud people who supported each other and stood together through this difficult time. A profound experience indeed. 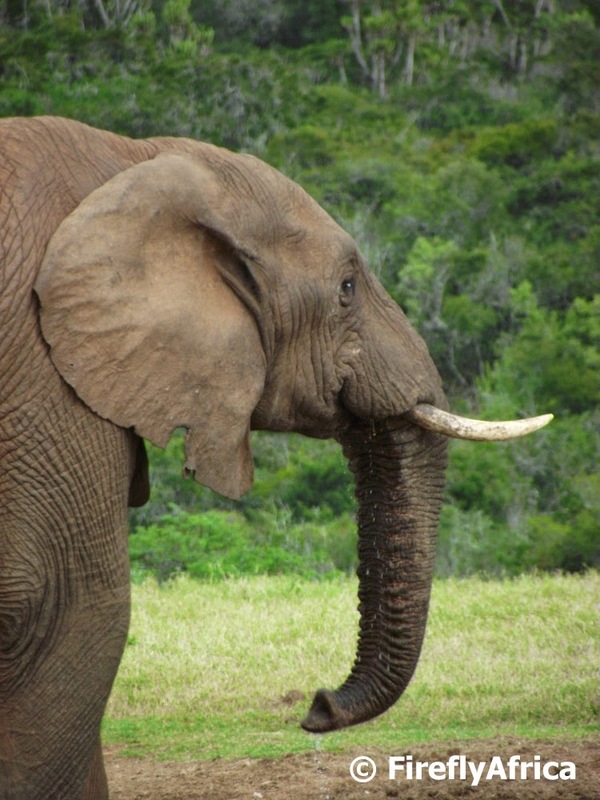 Way back when I started working in the tourism industry I worked as a freelance tourist guide and one of the companies that used me had tours going to Addo Elephant National Park just about every day. That means that I got to go to the park 5 or 6 times a week and I never got tired of it. These days I don't get to visit Addo nearly as much as I would like to and when I had the opportunity to drive through it on my way to a meeting I didn't say no. It was nice to spend some time with my old ellie friends, even if it was only for an hour or two. 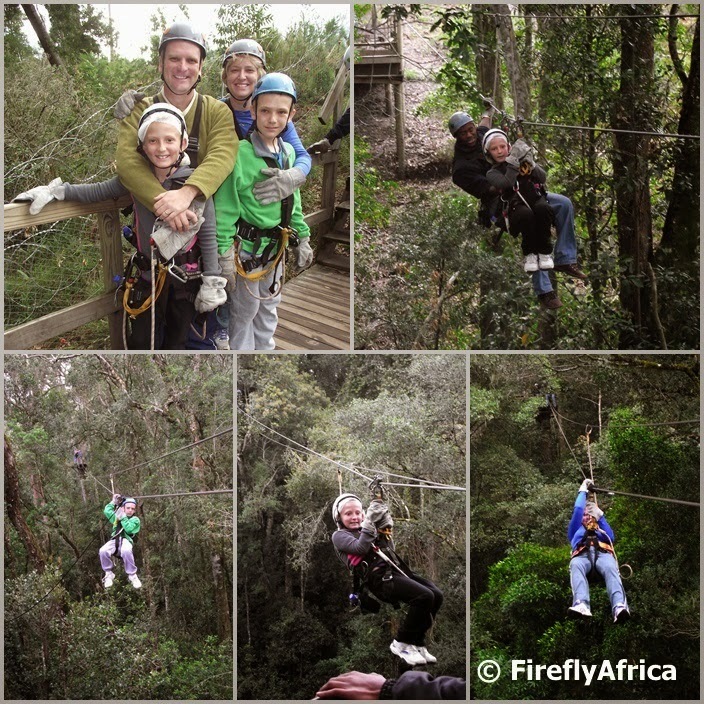 The Tsitsikamma is famous for its stunning scenery, magnificent forests and exciting adventures. I often wonder how many people visit here and marvel at the big things but totally miss the little ones. 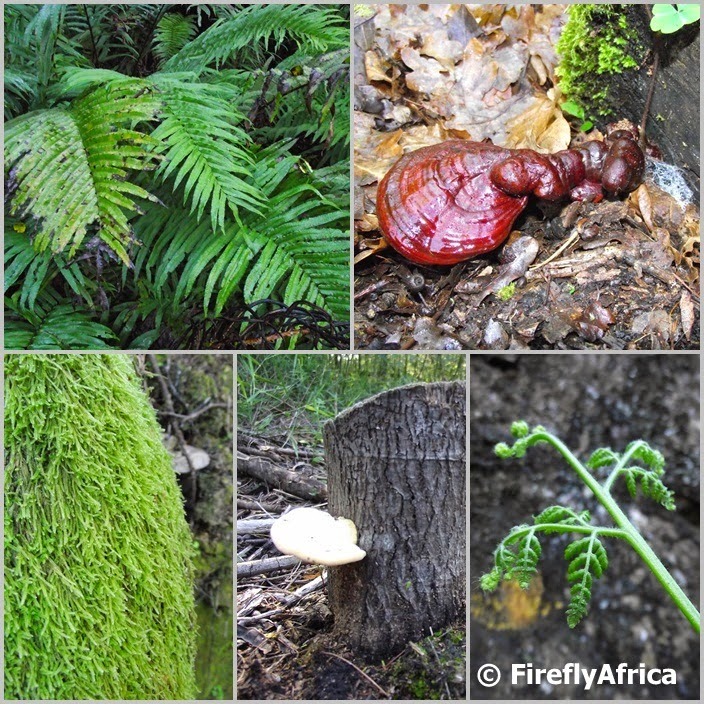 Ferns with new leaves opening up, soft moss growing on a rock, bracket fungus on the side of a log, the sound of a forest stream slowly flowing through the underbrush and over a little waterfall and the call of baboons in the distance. 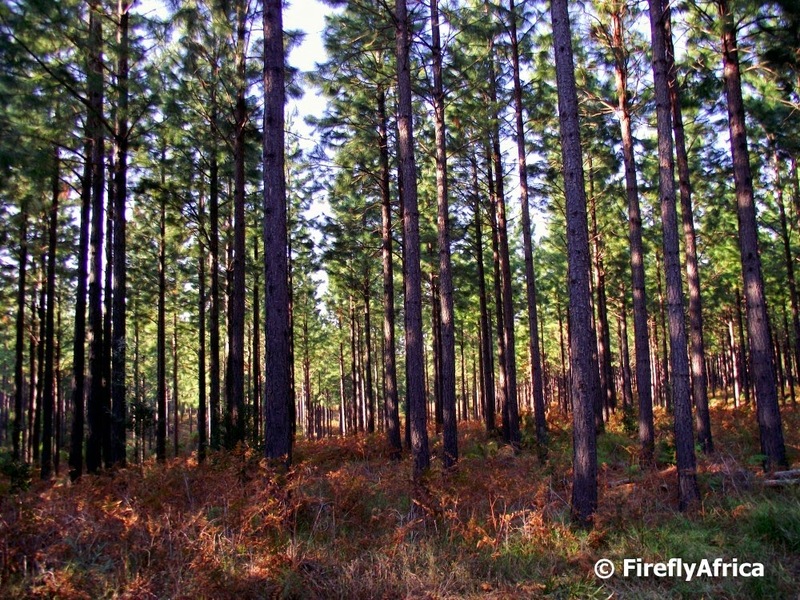 What about the sound of the wind in the trees, the breaking of a branch falling down, the smell of the moist forest and the red flash of a Knysna Loerie overhead followed by it's ko-ko-ko call. Suddenly I yearn to be in the forest, somewhere I go to feed my soul and always leave behind a piece of my heart.